Dengue fever, also known as breakbone fever, is a rapidly spreading viral disease, prevalent primarily in the tropics and now reported in over 120 countries. It is transmitted by the Aedes mosquito, a small mosquito with white dots or stripes over its abdomen, which is most active at dusk and dawn. Symptoms generally appear within 4 to 7 days of being bitten by an infected mosquito and include high fever, extreme lethargy, headaches, severe joint and muscle pain, skin rash, nausea and pain behind the eyes. In a small percentage of cases, the viral infection can develop into dengue hemorrhagic fever, a dangerous and potentially life-threatening condition. According to the WHO, dengue virus infections have increased dramatically in recent years and, on current estimates, approximately 390 million people are infected a year worldwide. Ten times this number live in an area where they are at heightened risk of contracting dengue fever. Clearly this is a serious and growing health problem. Although there are currently no pharmaceuticals available to treat dengue, it is still very important to be monitored by a doctor when suffering from the disease. By testing your blood, they can check that your white blood cell and platelet count are not dropping too low and that you are not at risk of dengue hemorrhagic fever. While there is no drug-based treatment for the disease, a popular natural remedy for dengue is papaya leaf. Many people report significant improvement in dengue symptoms from drinking the juice of papaya leaves and several studies have been done by doctors as to the effectiveness of this herbal remedy. This study, done by a Sri Lankan doctor, followed 12 patients diagnosed with dengue and low platelet count. They were given a 5 mL dose papaya leaf extract, obtained by crushing fresh papaya leaves, at eight hour intervals. Afterwards, all 12 patients with dengue were found to have elevated white blood cell counts and platelet counts, many significantly, in the day after the treatment was first administered. Dengue fever is known to drop platelet count and white blood cell levels, often dramatically, yet the papaya leaf cure seemed to quickly reverse the usual progression of the disease. None of the 12 patients required hospitalization following the papaya leaf juice administration and 5 patients with itching hemorrhagic skin rash found that it disappeared within 2 days of taking the dengue fever treatment. This Malaysian Ministry of Health website article discusses a randomized controlled trial on 228 hospital patients with dengue fever. In the trial, half were given papaya leaf juice for 3 days and experienced a significant increase in platelet count versus the control group. While the extracts used for these studies were prepared in the hospitals, a similarly potent liquid papaya leaf extract can be found here. If you are travelling to an area where dengue fever is common, or would just like to increase your blood platelet count after a viral infection or illness, this natural remedy is highly effective. Please do not juice papaya leaf or papaya seeds for dengue fever during pregnancy. There’s more on the potential side effects of papain from papaya here. Recently, my girlfriend and I traveled to Koh Tao in Thailand. Near the end of the holiday she developed a fever, skin rash, muscle and joint pain and was so weak she was unable to walk unaided. The symptoms came on very quickly as she had been fine the night before. We went to a clinic on the island as there was no hospital. They took a blood test and were so concerned they kept her in the clinic overnight on a drip while they waited for the results to come in. The next morning it was confirmed that she had dengue fever and she was transported, under medical supervision, to the larger island of Koh Samui the same day to be treated at a hospital. While her symptoms were bad at the start, she did seem to recover very quickly. Her initial blood test showed her white blood cells were at 1.63 L, which is quite low when the normal average is between 4.3 and 10.8. Her platelet count was approximately 125,000, with 145,000 to 450,000 considered normal. Subsequent blood tests over the following days (which I unfortunately don’t have access to now but did see at the time), showed both white blood cells and platelet count increased, rather than dipped as the doctor had told us to expect. On day 4, after seeing her latest blood test, the doctor wrote on her medical sheet ‘dengue without complications’. By day 6 both white blood cells and platelets were so significantly increased that she was told she had beaten the dengue viral infection and was fit to fly. This is a very good result as dengue fever is usually at least a 7-day infection with many reporting several weeks of symptoms. Even with a long flight back only 6 days after first being diagnosed, she seemed to have recovered well from the disease. While I have no definite proof that what I’m about to share helped by girlfriend recover from her illness, the doctor did seem very surprised that her blood tests were so positive. She’d previously warned us that the dengue symptoms would get a lot worse and we had no chance of catching our flight home in 6 days from the start of the viral infection. From my research on the beneficial properties of papaya seeds and papaya leaf as a cancer treatment, I knew the plant had some powerful enzymes like papain and chymopapain and alkaloids such as carpaine, as well as a wealth of flavonoids and other beneficial compounds. From the first night she had to stay in the clinic, I found a fresh papaya for her and she ate around a tablespoon of papaya seeds, chewed up and eaten with the fruit. This was repeated again in the morning, which was day 2 of the dengue infection. Both papaya seeds and papaya leaves are known to contain similar substances, though I suspect the seeds are best for parasites (and possibly malaria), while the juice or extract of papaya leaves is most often given for dengue. On day 3, I found a fruiting papaya tree in the local area and took a medium sized and relatively young leaf from the lower part of it. It was a little lighter green than the fully matured dark green leaves up the top of the plant. After washing it and pulling off the woody stem, I took it to a restaurant that made fruit smoothies and got them to blend it up with coconut water and pineapple. I had a good dose of this papaya leaf treatment myself first and had no side effects, though I have to be honest, it didn’t taste at all great. She had this blended papaya leaf, which would equate to a good dose of the juice, on the afternoon of day 3 and the morning of day 4. From my observation, her condition improved significantly after this. On the afternoon of day 4, I found a juicing shop and took another two young papaya leaves to them and had them added to a freshly made juice with pineapple, celery and beet, a known blood builder and liver toxic. She drank this dengue fever treatment, admittedly reluctantly as it tasted pretty terrible, on day 4, 5 and 6. Yet soon after drinking the papaya leaf juice on the first day it was clear that she was feeling noticeably better. And on the second she was up and walking around normally. After her third blood test on the afternoon of day 6, which came back with a near normal blood platelet count, she was declared by the doctor to have beaten dengue. In a difficult situation, without my usual equipment, I wasn’t able to prepare exact dosages like the studies above, or even a consistent method of delivering the papaya enzymes, alkaloids and other compounds. Regardless, it’s my personal belief that papaya leaf and perhaps the seeds made a big difference to her quick recovery from the dengue fever virus over those 6 days. The most commonly recommended method for using papaya for dengue is to first obtain fresh papaya leaves from a mature tree. In many tropical destinations papaya trees are prevalent and are easily found locally. You want the younger leaves at the lower part of the tree that haven’t yet reached their full size. Ideally, they should be from a fruiting tree, as this confirms that is a true papaya plant. If you can’t find a tree that is fruiting then study online images of papaya leaves closely to make sure you get the right plant. Similar sized and shaped trees may be toxic, though the papaya leaves themselves are distinctive. Check with a local if possible. Take them to a sink and wash them well then tear off the fibrous stem. You only want the young green leaves. Some resources recommend deveining these of their center part as well, though I didn’t do this. Next they need to be either juiced if you have a juicer, or crushed up and the juice squeezed out. You can use a filter cloth and pound the leaves to extract the juice. Alternatively, crush them up in a large mortar and pestle, or on a chopping board with the bottom of a jar and then squeeze out all the juice you can with your fingers. Usually only about 1 tablespoon of papaya leaf juice is obtained from a crushed leaf so crushing up 2 is recommended if you have to use this method. Take the juice at least twice a day, or every 6 hours if possible, on an empty stomach and diluting it with a bit of water. It’s best to hold your nose and shot the papaya leaf juice down as the taste isn’t pleasant. Realistically, for people traveling who contract dengue, or those who don’t have the equipment to prepare the papaya leaves, finding a juicing shop and taking the leaves to them as I did is the simplest method. When I went to the juice bar in Koh Samui near the hospital they told me other people had come to them in the past with the same request to juice fresh leaves from papaya trees. Choose a healthy juice option and get them to juice your washed papaya leaves with it. I chose one with beets for the liver benefits and pineapple for its bromelain. If they had papaya juice available I would’ve used that as well. You can try adding lots of sweet fruits but realistically the juice is not going to taste good. It will be bitter and hard to drink but I think most people would deal with that to speed up their recovery with this dengue fever treatment. Don’t add sugar as you need your body healthy and sugar only damages it. Papaya leaf is also often recommended for treating malaria and for this purpose it is regularly boiled and taken as a tea. While this method may work for preventing or recovering from malaria, it isn’t recommended for dengue fever. Use the fresh, unheated papaya leaf juice only. If you’re suffering from dengue then it’s important to visit a doctor and have your blood tested for white blood cell and platelet count every couple of days. Beyond that, and making sure you stay well hydrated, there’s not a lot modern medicine can do for this debilitating illness. Fresh papaya leaf juice is a natural remedy for dengue fever that is gaining popularity because, in both small studies and many people’s personal experiences, its effect on recovering from the dengue viral infection is dramatic. I’d appreciate hearing from anyone who has tried using papaya leaf for dengue, or similar mosquito borne infections like yellow fever virus and West Nile virus, in the comments below, especially how you prepared it and any blood test results you had. Please share this page with your friends as well. Even if you don’t live in an area where dengue fever is common, many people travel to tropical destinations where it is and need to know that there is a treatment available for this terrible disease. Back when I was a US Peace Corps volunteer in the Philippines, I contracted dengue fever and spent spent a week in the hospital. I now live in the same island with papaya trees growing in the yard. I’m now enjoying the taste and many benefits of eating papaya fruit. Surprisingly here where dengue can be a problem, I haven’t heard any feedback locally in the news about this as a treatment. I’m now surely going to eat papaya seeds for digestive health, but if need be I would surely try papaya leaves for dengue. Thanks for your comments Queenie. The papaya leaf cure for dengue doesn’t seem to be widely known but some of the locals I spoke to in Thailand had heard of it. I’d appreciate if you could share it on social media to spread the word. Admittedly papaya leaf juice does taste pretty bad but it’s well worth it to help you recover from dengue fever. Yes in india it is well known by all the locals where i live. There is not a single dengue patient who has not taken it. Mainly for maintaining platelet count. Hi Giridhari and thanks for your comments. How do the locals usually take papaya leaf for dengue where you live? It is known in Malaysia that papaya leaf juice is been used to cure dengue fever. Besides papaya leaf, there were using crab soup remedy for the same dengue fever. That sounds like a good result, especially in an older patient. I hope she recovers fully. Hi Azman and thanks for your comments. Can I ask what is in the crab soup remedy for dengue? I live in Delhi, Every Year dengue patients are given papaya leave juice & that has a miraculous effect on the platelet count of every patient. they recover very fast in a day or 2 , even those patients whose platelet count is very low it increases it very fast , people see the result in a first dose only. Hi Rajat and thanks for your comments. Few people in Western countries seem to know about how well papaya leaf juice works for dengue fever, even though the disease is spreading and there is no drug based treatment. I believe it should certainly help recovery for males (you’re right on pregnant females as I highlight in that article). The question is whether the virus would still linger even after recovery and be an issue. There’s no clear research on this to my knowledge. Hi , I live in Philippines and I had dengue in December of 2015. I heard about papaya leaves extract as a cure to dengue so I tried that. The best thing to do is to add honey to the extract to lessen the bitter taste of it. I had fever for several days and had to be confined at the hospital when my platelet count was below 100 (normal is 150-400). Had lots of 100% fruit juices, took vit.c tablets and had plenty of water to help hydrate myself since they said the virus will easily dehydrate the patients. Luckily, I only stayed one night at the hospital :), and thanks to papaya extract. Hi Madilyn and thanks for your comments. Dengue is horrible and I believe it’s important to spread the word on using papaya leaves as a treatment for it. As my brother-in-law was suffering from fever for the last 3-4 days, we visited near by hospital and doctor suggested to have blood test and Dengue test. On 13th Sep evening platelets count was 1.2 lacs. On 14th Sep morning, platelets count was 1.0 lac and Dengue test results are positive. Doctor asked to admit in hospital. But immediately we checked with few friends and relatives, one of them suggested to have papaya leaf juice. I got some papaya leaves, grinded them to juice and gave it to him twice in a gap of 5 hours. Anyways, on the same day evening, to be at the safe side, we admitted him in the hospital. On 15th Sep morning, doctor suggested for blood test and now the platelets count is 2.0 lacs. We are relaxed now. Anyways, Thanks Jim for the article. You are right.. I have given this to the people with malaria. I advised them to take it boiled with Tulsi, Mint and ginger. The water tastes bitter but they feel the difference within no time. Thank You very much for your beautiful narration and explanation which is very easy to follow. I am from odisha but live in pondicherry, karaikal due to my job. Me too have the same symptoms of dengue fever and going to follow the same ways and methods That u shared, after the blood test. Thanks a lot!!! Hi Ravi and thanks for your comments on improving blood platelet count with papaya leaf juice. It would be good if doctors could recommend this dengue treatment given there are no drugs to take. Until that starts happening I appreciate people like you sharing this important information that papaya leaf juice can help recovery from dengue fever. Hi Dominic and thanks for your comments. It’s interesting to know you’ve found papaya leaf good for malaria as well. I agree it tastes bad but why should that matter if it’s helping people recover from illnesses like malaria and dengue. Hi Anjun and thank you for your positive comments. I believe this is important information to share on treating dengue fever with papaya leaf juice and hope it can help many more people out there. Hi Jade and thank you for your positive comments. I hope papaya leaf can help your friend with dengue fever as it has many others. I am interested to learn if any benefits are derived from the papaya leaf juicing or the fresh seeds ground up for fatty liver disease. If it helps cirrhosis of the liver, might it also help fatty liver disease? It cures the symptoms in a few hours and the dengue is gone in two or three days. This works for most viruses it´s unbelievable! thank you for thei info. When my cousin had a 5 days fever we visited the doctor immediately and he request a blood test after that he diagnose that she has a dengue fever because her platelet count is very low and she has rashes on her feetthe doctor told us that it can immediately cure he advice her to eat plenty foods and fruits as well.next day after we went to the doctor he request again for blood test but her platelet count goes very very low and he told that she need to confine but my cousin refuse it because she is afraid. Our neighbor told me about the papaya leaf extract to boil the papaya with some water then blend it then get the juice and drink it 1-2 glass a day and after a day she went to a laboratory to test her blood again and i was amaze her platelet count is normal after drinking the papaya leaf extract and her rashes disappear after 3 days. I believe papaya seeds might help fatty liver disease as they help liver cirrhosis. There’s a method for using them for this purpose here https://superfoodprofiles.com/health-benefits-papaya-seeds or simply add an equivilent amount to a smoothie. Hi Roger and thanks for the information. I’d not read anything on using marigold leaves for dengue before. How is it usually prepared and taken? I hope the papaya leaf juice can help your daughter recover from dengue. Know it tastes pretty terrible but if it makes her feel better and increases her platelet count as it did for my girlfriend and other commenters on here it will be well worth it. Hi Janela and thanks for sharing this. Dengue hemorrhagic fever is a rarer complication from dengue that does need to be monitored by a doctor so, while there are no drugs to prescribe, a doctor should take regular blood tests for someone suffering from dengue fever. That said, it’s great to hear papaya leaf worked so well for your cousin and that the boiled extract was also effective. here in the Solomon islands dengue fever is quite a bit of a problem. sadly when we finally eradicate malaria,another disease pops up. anyways thanks for the infor about papaya leave’s juice. just a few remarks about another solution I find very effective is a nation wide cleanup campaign. In 2014 our medical authority announced that hundreds of people died in our hospital in the length of one month due to dengue fever. Later they initiate a national clean up day. Months later we never heard of dengue cases. Hi Clyde and thanks for your comments. That is terrible to hear so many people died from dengue. I wonder whether using papaya leaf juice could have helped keep many of their blood platelets at high enough levels to survive. I think it’s important to share this article with others in your community. You are right that people returning from holidays are likely bringing the dengue virus back in with them to spread again. While sugar cane juice is better than processed sugar it’s still incredibly taxing for your body to deal with. Not what you need when dealing with dengue fever. I’d recommend just holding your nose and throwing it down. Surely a moment of bad taste is better than days of agony from dengue. If you really can’t handle it try adding some drops of stevia https://superfoodprofiles.com/health-benefits-of-stevia-sugar-substitute It won’t damage your body like sugar. Thank you It saved my life.I travel all over the world.,usually take anti repellent as a routine when travelling to dengue infested areas,unfortunately this time this precaution was not taken. Developed fever with chills and rigors.and on the third a day a macular popular rash. On checking the blood,my white cell count was 1800 and platelets was 80. My count went down from 80 to 48 on third day. Hope and wish this treatment would be recommended by western qualified doctors without any fear. So recovery is not prolonged.I would recommend it to any one with early stages of the disease. Thank you for this important comment Dr Rajapaksa. A blood platelet count of 48 is indeed dangerously low. I’m really glad you found the papaya leaf dengue treatment and it helped you recover. When there is no drug based treatment I think it’s really important that this natural remedy for dengue fever is more widely known and Western doctors be open to an option that doesn’t come in pharmaceutical packaging. I agreed too that the earlier you can take the papaya leaf juice, the quicker it will help you to recover from dengue. All the best and thank you again for writing in. Hi Ryan and thanks for writing in with such great results from using papaya leaf for dengue. That’s a quick recovery. I really wish this information was more widely known as there are still people suffering thinking there’s no dengue fever treatment. Please share the article if you get a chance. Never know who it may help. I can see several options with a search for “papaya leaves delivered usa” if you don’t live in a warmer area where papaya plants are common. Papaya fruit based supplements won’t help. Papaya leaf tincture might but I’d expect the fresh leaves juiced would be much more effective. Usually people who contract dengue fever do so in tropical areas where papaya plants are common but if not an overnight delivery of the leaves would be better than the tincture in my opinion. Hello…I’m from India. It’s good to know about this beneficial effect of papaya leaf in curing dengue…..but, can it be used as same way in curing normal viral fever with headache?? I had contacted Dengue 4 years back. My wife got scared and searched on the net about Papaya leaf treatment. I just had three 5ml juice from fresh papaya tree,on empty stomatch for 3 consequetive days. Believe me, on 1st drink the platlets increased to 15000. On second and third it galloped by 30000 then 60000 counts. Every time we called the pathologist home to check only CBC and platlet.It had dropped to 100000 earlier. It is a very effective remedy for dengue. Incidently, I had a papaya tree at my backyard. The above article is genuine and Papaya leaf works miraculously. Maintain fluid intake regularly. Thanks so much for the info on papaya leaf extract. I was infected with dengue, 4-days ago with fever consistently at 102F with short spells of relief for 2-3hours. My wife gave me papaya leaf juice(30ml each dosage, three times a day before food) 3rd day of fever and miraculously, my platelets have improved to 170,000. Before trying this juice I thought it was a hoax. Now I have informed my doc that it is a Sure shot medicine. Please go ahead and use it without hesitation. I want to know that what happen if any one take papaya leaves juice without having dengue fever? Last year we were in Siliguri in West Bengal (India) where my younger son was infected by dengue virus. His platelet count downed to 75000. Doctor advised to admit him in a hospital. I was nervous because it happened at the end of our tour schedule and I had not enough money with me to meet the hospital cost . Then a friend told me to give my son papaya leaf juice 25ml a day dividing in two doses with one teaspoon of honey because of its bitter taste. I followed my friend’s advice and it was like magic that the next day of giving my son the juice his platelet count increased to 150000. It was just miracle. Staying one more day we came back to our home with my son. His platelet count increased to 195000 from 75000 within three days. Papaya leaf juice saved me a heavy hospital bill. From then I share my experience to all my relatives and friends. Thank you for sharing your good results as many other have with papaya leaf. I think there’s little doubt it increases blood platelet levels. I have read of good results with malaria as well, though this must be monitored by a doctor. 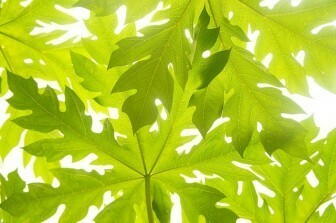 The papaya leaf mechanism seems to be to increase blood platelet levels. If a viral infection is lowering these then it may well help, though I’m not aware of any studies on viral fever. Hi Nilesh and thank you for your very helpful comments on increased blood platelets. With all the positive responses to this article on using papaya leaf for dengue fever I’m finding it surprising that it is not considered a standard treatment for dengue. Perhaps being a natural treatment rather than a pill has something to do with it. Good advice on maintaining fluid intake as well. I’m from Mumbai. My son was diagnosed with dengue on Tuesday evening with the platelet count of 65000. He was admitted to the hospital. He was not ready to take the papaya leaf juice till Wednesday. But we convinced him and he took half a spoonful on Thursday afternoon. The platelet count was 76000 the next morning. Then he readily took the juice twice a day on Friday. The morning report was 81000 and evening report was 120000. And he was discharged from the hospital yesterday night. The papaya leaf juice did help him get better. Papaya leaf juice works really well in case of dengue fever and to increase the number of platelets. Can drinking papaya leaf juice protect you from getting infected? Or is it helpful only to increase the platelet count. There are 8-10 people dying of dengue every day near where I live. Can we make a soup out of papaya leaves and drink it ? Does it help? Hi Srini and thank you for writing in with your very positive results. This is indeed an excellent result and I think your dosing was excellent. I hope you will share the article with anyone else in need of it as papaya leaf is really beneficial for anyone suffering from dengue fever. I imagine it would boost your blood platelet levels and possibly immunity. Hi Chanchal and thank you for sharing your experience. This is indeed a great result with using papaya leaf for dengue and I’m glad it helped your son so well. Please share this article with friends you think it could help. You’re right that it can be very important in situations like this. Hi Vastavi and thank you for sharing your experience with using papaya leaf to treat dengue with your son. I’m really glad it helped him so well. There are so many positive stories of how papaya leaf juice cures dengue fever I really believe it should be considered standard treatment for the disease. That’s terrible that people are dying from dengue in your area. Taking papaya leaf juice probably wouldn’t stop a person from being infected with dengue if bitten by a carrier mosquito. It could though help them to fight back immediately and give them a good head start in increasing their blood platelets back up to a healthy level. Usually very low blood platelets is the most dangerous symptom of dengue infection which is what papaya leaf juice appears to counter. It’s possible if a person were taking a daily dose of papaya leaves they would have much milder symptoms if infected and recover much quicker. I had chikungunya few months ago. Terrible aches and pains all over body joints, and had extreme difficulty in moving for more than 2 months. I couldn’t work and basically was just lying down the whole day. Though this wasn’t dengue, I figured it better work to bring the inflammation of my joints down. I prepared about a liter of smoothie combining papaya leaf with bananas, to make the taste more agreeable. The aches slowly disappeared, and within a week, I was completely pain free. Hi Joy and thanks for your comments. There is very little I could find on using papaya leaves for chikungunya but the viruses are similar so it would make sense that the compounds in papaya leaf would help to treat chikungunya virus as well. It sounds like you had a bad case of it so glad the papaya leaf preparation was able to help. I just came to know that me and my mom was suffering from dengue I saw your blog and ordered my people to bring papaya leaf and make a juice for us. Hope it will work let see will definitely reply u back soon. It’s important to get your blood platelet count checked by a doctor but papaya leaf juice has been very beneficial for many people suffering from dengue fever. I hope it works for you and your mother too.